To ensure a better future for your discs use jewel cases with a past. Plastic CD jewel cases tend to break if you even look at them hard. And sometimes you get CDs that have never been inside a jewel case. Yet they are still the best way to store and protect your CDs or DVDs. Without them they wouldn't have much of a future. 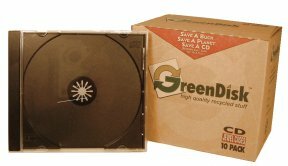 Now you can replace all the cases you are missing with GreenDisk Recycled Jewel Cases. Every year millions of unopened music, movies and software packages become obsolete or out of date. We recycle all the packaging material and recover the still pristine professional grade jewel cases.